Have you always wanted to swim with the dolphins? Here is your chance. There are several programs available to suit all ages and all needs. 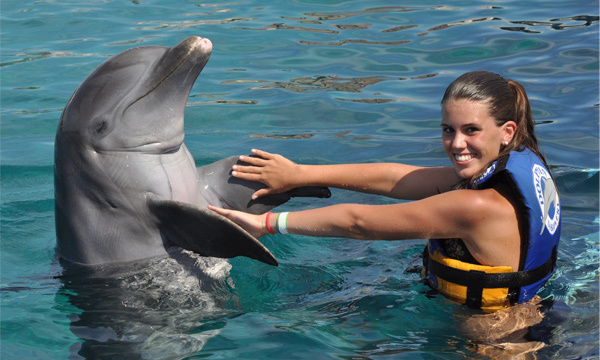 You will get to interact with the dolphins, stroke their soft skin and get a glimpse of their nature. The knowledgeable trainers will also teach you about their biology and behavior. Book at least 45 days in advance and receive 25% discount. Book between 30- 44 days in advance and receive 20% discount. Book between 15-29 days in advance and receive 15% discount. Book between 4-14 days and receive a 10% discount. Discount is calculated at the time of booking. This is a great family experience. Children under 5 pay only $39 when swimming with a paying adult. Your 40 minutes in the water take place on a platform, so adults can stand at all times. 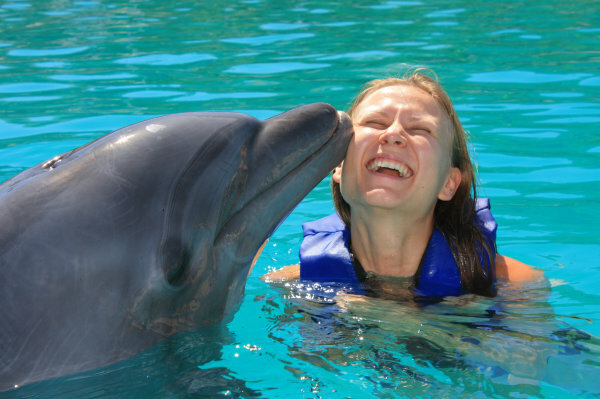 This is a great advantage for those that are not strong swimmers but want to experience a dolphin encounter. The experience includes handshakes, hugs and kisses, free time, dancing and games with balls. When making your reservation, do not include children under 5. Finalize the reservation for all swimmers over age 5 and then email us at customercare@mayanriviera.com to add the infants and/or children to your booking. If you are pregnant, 5 months or less, you are permitted to participate in this program as long as you are with another paying adult and sign the responsibility form. For the boogie board part you will have to be able to swim out a short way. You lie on the boogie board and the dolphin will approach from behind and push your feet to propel you forward. For the belly ride, you also swim out put you will hold the dolphins fins and lay on their belly while they swim. What a rush! Kids must be aged 8 or older, 4′ in height and accompanied by a paying adult. 10 minute briefing – 40 minutes in the water – maximum of 12 participants. The ultimate dolphin swim! 2 dolphins at the same time for more contact and experience. Activities include ball games, handshake, free time, hugs and kisses. Participants must be able to swim out of the platform. 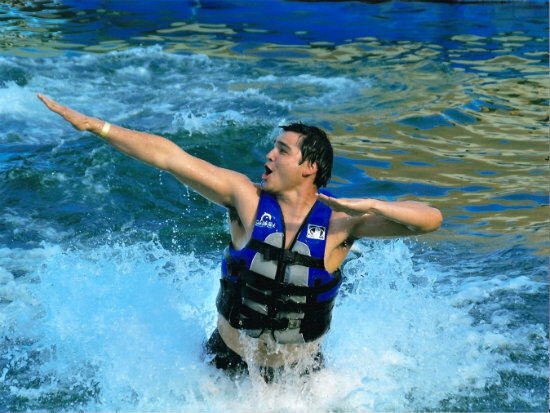 In addition, you get the famous foot push experience that will have you flying through the air as the dolphins push on the soles of your feet. 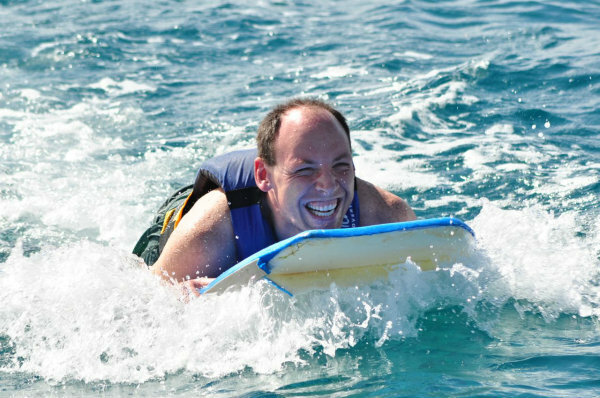 The dorsal tow will have you smiling from ear to ear as you hold the dolphins fins and get taken for a ride. 10 minute briefing – 50 minutes in the water – maximum of 10 participants. Dolphin Royal Swim + a Manatee Encounter. 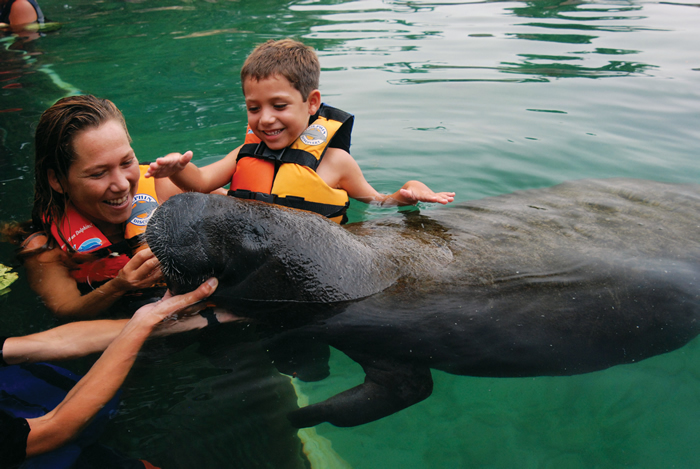 In addition to the Royal Swim, you will get a 30 minute encounter with Manatees. Don’t let their 1300 pound (600 kg) frame scare you, they are gentle giants with only 2 teeth! You will get to hug and kiss them, beware their whiskers may tickle! You also get to feed them their lettuce lunch while the trainer teaches you a bit about them. Roundtrip transportation to the dolphinarium. You also get access to lockers, showers and equipment (life jackets and snorkeling equipment when applicable). * Book early and save $. * Wear biodegradable sunscreen and take off your jewelry as it may scratch the dolphins. * Bring your own towels & wear water shoes if you have them. If you are pregnant, 5 months or less, you are permitted to participate in the Dolphin Encounter program as long as you are with another paying adult and sign the responsibility form. The dolphin site is wheelchair friendly, however, they do not have a hoist available for the dolphin swims. There are several stairs to manipulate in order to gain access to the swimming area. Please feel free to contact us for additional information. Photos, souvenirs, refreshments and additional activities in Puerto Aventuras.